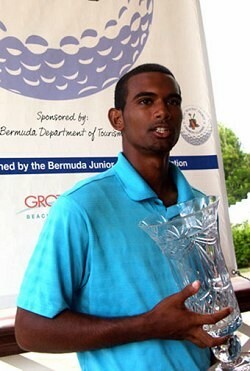 Damian Palanyandi and Katrin Burnie were crowned the 2018 Bermuda Golf Association’s Thanksgiving Challenge on the Hill Male and Female Champions at Turtle Hill Golf Course. This was a 36 hole Individual Stroke Play event on the same day. In the Men’s Division, Palanyandi was the winner at 1-under par with rounds of 53 and 54 for a total of 107, Jeffrey Lindo was second at 6-over par with double rounds of 57 and Gary Burnet was third on retrogression at 11-over par with rounds of 64 and 55. In the Ladies Division, Burnie shot two rounds of 54 to finish at Even Par overall, Irene Foti was second at 2-over par after rounds of 55 and Elizabeth Carpio was third at 8-over par after rounds of 59 and 57.